This is currently one of the top selling ellipticals at NordicTrack. And with these features and this price it's no surprise why. These hybrid cardio machines provide a stepper, an elliptical and a treadmill all in one, offering one of the most complete cardio workouts you can ever have. Get the best deals on this #1 rated elliptical on the official NordicTrack site. Overview: The NordicTrack FreeStride Trainer FS7i is the latest model in this ever-evolving series of hybrid cardio trainers offering three workouts in one: an elliptical, a stepper, and a treadmill. For those who want to take their workout to the next level, these machines will help you reach new heights of fitness and endurance. This is hands down one of the best ellipticals you can buy for your home and has been at the top of our ratings for the past few years. The newest model ups the ante to a whopping 32″ so you can really stretch out as far as you could ever want. Use it as a stepping machine with a shorter stride, increase it to mimic an elliptical stride, or let it go to full length like you’re running on a treadmill. All three FreeStride Trainers, including the base FS5i elliptical, offer this generous stride length. The FreeStride FS7i offers very comfortable, extra wide pedals that ride on belts rather than the traditional rails, so you feel like you’re sort of suspended in air rather than working out on a surface. There is less impact and therefore you can stay on for a longer period of time. Of all of the NordicTrack ellipticals, the FS7i and other FreeStriders offer the most impact-free, comfortable motion you’ll find. In addition to adjusting your stride any way you like it, you can go up to a 10% incline to further change up your work out. This allows you to target different muscle groups as you move along the incline. Another great way to enhance your workouts and target more muscle groups. If you’re looking for decline capability as well, you can check out the big brother FS9i, which also has a larger screen, higher weight capacity and a few more workouts built in. 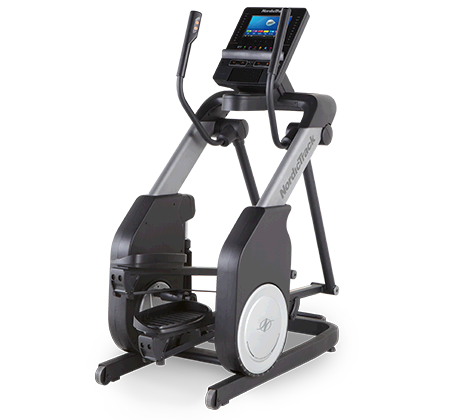 The NordicTrack FS7i is equipped with iFit Coach technology, as most of the higher priced machines are. This allows you to walk, jog or run anywhere in the world virtually with Google maps, and take advantage of unlimited on demand workouts with personal trainers from across the globe. The machine automatically adjusts its incline to match the terrain of the location you have selected while you see it unfold right in front of you. You also get tracking capability, nutrition recommendations, sharing tools and much more. Even though we love traditional elliptical trainers, we also love trying machines that offer something a little different. And the FreeStride Trainer certainly does not disappoint. Typically, the makers of hybrid trainers tend to skimp on materials when trying to make machines that do a few different things. You’ll get a bike and an elliptical for $599 and it just feels like the whole think is made out of tin. Not so with these powerful machines. They are built rock solid and look like something you’d see in your local health club. That was a good first sign…. We were able to put the trainer together in about 45 minutes start to finish, so set up is a bit easier than usual. We then hopped on and gave it a whirl. In a word, it was great. We went right to an elliptical length stride and amped up the incline a bit to see what we were up against. It felt really nice. As the manufacturer indicates, it does actually feel like you are suspended mid-air. It’s a bit unsettling for a the first few seconds but after that it’s amazing how light you feel even though you are working out pretty hard. We then eased into a stepping mode and that felt pretty good, even though that’s not our typical workout. It then came time to crank it all the way up to 32″ and see what that was all about. We must admit that got pretty intense, perhaps because we also cranked the incline to 10%. That got our hearts pumping as that is a very long stride length. The typical stride length on an elliptical is 18-20″ just to give you an idea of the difference. All in all, we really enjoyed our workout on the FreeStride Trainer FS7i. Because you are walking/running directly over the mid drive mechanism, you feel very stable, just like on their ACT Commercial ellipticals. It’s very smooth and quiet even at the highest resistance and incline levels. You can really target all of your muscle groups and easily transition between stepper, elliptical and treadmill motions. If you’re looking for a powerful machine that really allows you to ramp up your workouts, this one is very hard to beat and a truly great choice. You get a step machine, an elliptical trainer and a treadmill all in one, with incline capability, solid construction, comfortable stride and built in iFit technology. Of course, these machines are not cheap, at around $1,799 to 1,999, depending on the current sale. But, for what you are getting, it’s well worth it. We would definitely say these are not for casual use by any means. These are more for those who want to really push themselves to new heights and get into the best shape of their lives. The company is currently offering special deals and a money back guarantee, so now is a great time to try one out if you’re up to the challenge. Check out this Best Buy winner on special sale now at the NordicTrack site! How Much Should I Pay For a New Elliptical? A Look at the 2019 Ellipticals – What’s New? The All New Bowflex Max Intelligence App…What’s it All About? Copyright © 2012-2019 EllipticalReviewGuru.com. All rights reserved.